The Easter Fair at the Stanley Park Train returns for limited dates between March 17th and April 2nd this year. There will be egg hunts, a Bunny Burrow maze, bouncers and carnival games, face-painting by the Doodle Girls and treats from Cloud Nine Cotton Candy and The Praguery. Where: Located just off Pipeline Road in Stanley Park, via the West Georgia Street park entrance. Arrive no later than 4:00 pm to allow time for all activities. Last egg hunt is at 4:40pm. Tickets: Buy online here or phone (604) 252-3700. Service fees apply. Buy same-day tickets in person at the train ticket booth next to the train, starting at 9:30am. They reserve 20% of each day’s tickets for sale at the ticket booth. Arrive early to avoid sold-out time slots. The Easter egg hunt runs throughout the day in the farmyard with treats from Daniel le Chocolat Belge! Bring your own basket. Toddlers hunt indoors in the small Barn. Admission for the hunt is $5 (prices do not include tax). Last entry is at 4:40pm. For carnival activities, strip tickets can be purchased on site for $2. On rainy days, you can stay dry with a covered train and line-up, and indoor egg hunt. 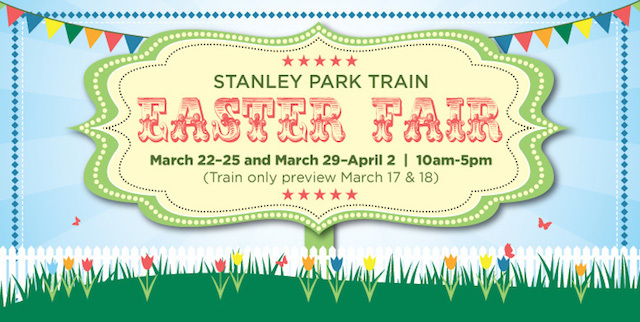 More information is available on the Stanley Park Easter Train website.